Lewistown Pistol Club is again holding monthly NSSF Rimfire matches for the 2017 season. For those not familiar with the NSSF Rimfire program, these matches are steel target matches using both a .22LR pistol and rifle. A stage generally consists of 5 steel targets, one of which is designated as the STOP plate, that must be shot last. The first 4 can be shot in any order the shooter chooses. Each stage is shot 5 times and your best (fastest) 4 times are counted for score. 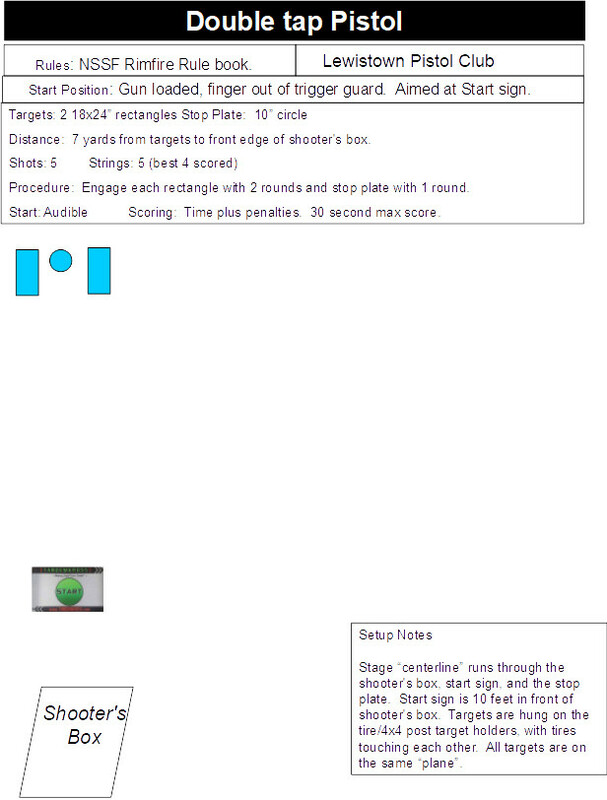 Targets are generally 7-20 yards from away and vary from 6 inch round targets up to and including 18x24 rectangles. All strings start with the firearm held aimed at a designated aiming point (generally a small "traffic" cone) so no holsters are needed. PLEASE NOTE: ALL FIREARMS ARE TO BE BAGGED/CASED AT ALL TIMES when not in use. Firearms may only be unbagged/uncased at the firing line under the supervision of a match official -OR- in the DESIGNATED SAFE AREA. NO AMMO IN SAFE AREA. These matches will be held on the first Sunday of each month and are generally 6 stages. (3 stages with rifle, 3 with pistol). This puts the minimum round count at 150 for the match, but make sure to bring more to allow for 'make up' shots. 2) At least 2 magazines for each. 5-6 works best. There are 2 divisions, Open and Limited. allowed. No electronic sights or optics are allowed. Matches are open to anyone who can legally possess and safely use both a .22lr rifle and pistol. Anyone under the age of 18 needs to have a parent supervising them at all times. New this year, we are using Practiscore for both registration and match scoring. While walk ons will be accepted, preregistration speeds up the pre-match process, especially for groups who want to shoot together, as once registered, you will be able to choose your own squad. Currently, we are not set up for online payment so all payments will be cash on match morning. Wish I could... just too far for me. (04-28-2017, 10:35 AM)bigdawgbeav Wrote: Wish I could... just too far for me. Working on something else that might interest you, just need to get some final details nailed down before I start talking about it. Hopefully in the next week or two I'll be able to say more. Registration is now open for the September NSSF Rimfire match. We are going to run on both Saturday and Sunday again this month. Make sure you're selecting the correct day when choosing your squad. Same stages both days, just people who can't attend one day may shoot the other. Or, shoot Open Saturday and Limited on Sunday. SEPTEMBER SPECIAL, bring a *NEW* junior shooter (under 18) and the Junior shoots for free and the adult who brings the shooter can shoot for only $5. Also, starting this month, we are going to begin keeping "club records". There will be 4 stages written up and we will rotate 1 of these stages into each month's match. We will keep both "season best" and "overall best" times for each stage and we will have 3 categories. "Junior" (under 18) "Senior" (62 and over) and "General" (everyone else). Attached is an image of the record stage for the September match. My best was a 1.54. We only had 6 competitors that month, best string time for the day was a 1.43.